The Lezyne Pressure Drive is a compact HP hand pump made of custom CNC machined aluminum for precise and lightweight construction. The HP pump design easily inflates tires to riding pressure with fewer strokes. The overlapping handle and barrel are integrated into a compact design. 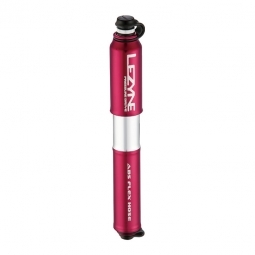 It comes equipped with Lezyne's ABS Flex Hose, which has a threaded Presta connection with ABS on one side and a threaded Shrader connection on the other.